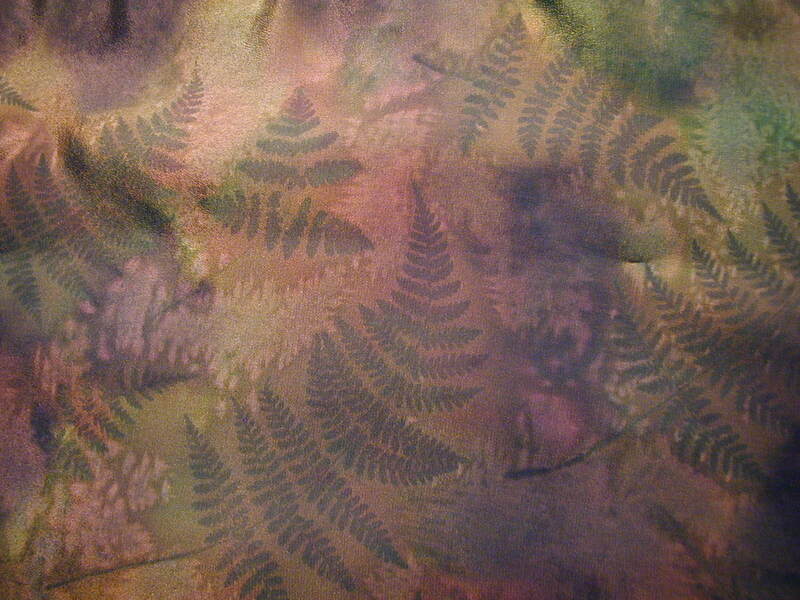 All silk wallhangings are hand painted on 100% pure silk and are unique in colour pattern. Silk screening is utilized for some design type (e.g. SERIES). Atlantic puffin (Fratercula arctica) Puffins are any of three small species of alcids (auks) in the bird genus Fratercula with a brightly coloured beak during the breeding season. These are pelagic seabirds that feed primarily by diving in the water. They breed in large colonies on coastal cliffs or offshore islands, nesting in crevices among rocks or in burrows in the soil. Two species, the tufted puffin and horned puffin, are found in the North Pacific Ocean, while the Atlantic puffin is found in the North Atlantic Ocean. All puffin species have predominantly black or black and white plumage, a stocky build, and large beaks. They shed the colourful outer parts of their bills after the breeding season, leaving a smaller and duller beak. Their short wings are adapted for swimming with a flying technique under water. In the air, they beat their wings rapidly (up to 400 times per minute) in swift flight, often flying low over the ocean's surface. The puffins are stocky, short-winged and short-tailed birds, with black upper parts and white or brownish-grey underparts. The head has a black cap, the face is mainly white, and the feet are orange-red. The bill appears large and colourful during the breeding season. The colourful outer part of the bill is shed after the breeding season, revealing a smaller and duller true bill beneath. 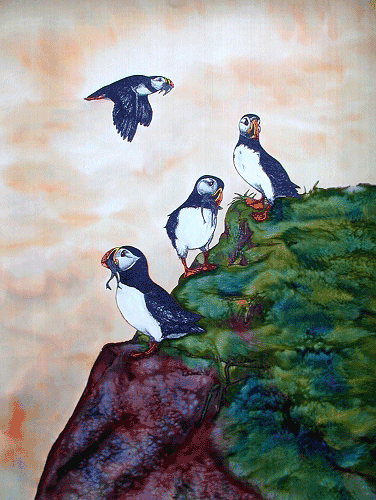 Although the puffins are vocal at their breeding colonies, they are silent at sea. They fly relatively high above the water, typically 10 m (33 ft) as compared with the 1.6 m (5.2 ft) of other auks. The killer whale or orca (Orcinus orca) is a toothed whale belonging to the oceanic dolphin family, of which it is the largest member. Killer whales are found in all oceans, from Arctic and Antarctic regions to tropical seas. Killer whales have a diverse diet, although individual populations often specialize in particular types of prey. Some feed exclusively on fish, while others hunt marine mammals such as seals and dolphins. They have been known to attack baleen whale calves, and even adult whales. Killer whales are apex predators, as there is no animal which preys on them. Killer whales are highly social; some populations are composed of matrilineal family groups (pods) which are the most stable of any animal species. Their sophisticated hunting techniques and vocal behaviours, which are often specific to a particular group and passed across generations, have been described as manifestations of animal culture. The IUCN (International Union for the Conservation of Nature) currently assesses the orca's conservation status as data deficient because of the likelihood that two or more killer whale types are separate species. Some local populations are considered threatened or endangered due to prey depletion, habitat loss, pollution (by PCBs), capture for marine mammal parks, and conflicts with human fisheries. In late 2005, the Southern Resident Killer Whales, the population that inhabits British Columbia and Washington state waters, were placed on the U.S. Endangered Species list. Wild killer whales are not considered a threat to humans, but there have been cases of captive orcas killing or injuring their handlers at marine theme parks. 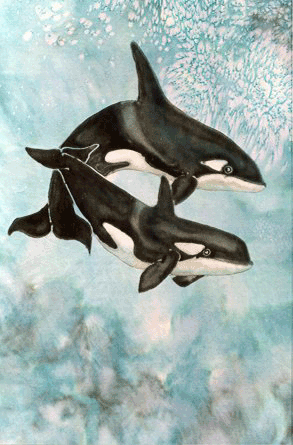 Killer whales feature strongly in the mythologies of indigenous cultures, with their reputation ranging from being the souls of humans to merciless killers. The humpback whale (Megaptera novaeangliae) is a species of baleen whale. One of the larger rorqual species, adults range in length from 12–16 m (39–52 ft) and weigh about 36,000 kg (79,000 lb). The humpback has a distinctive body shape, with long pectoral fins and a knobbly head. It is known for breaching and other distinctive surface behaviors, making it popular with whale watchers. Males produce a complex song lasting 10 to 20 minutes, which they repeat for hours at a time. Its purpose is not clear, though it may have a role in mating. Found in oceans and seas around the world, humpback whales typically migrate up to 25,000 km (16,000 mi) each year. Humpbacks feed only in summer, in polar waters, and migrate to tropical or subtropical waters to breed and give birth in the winter when they fast and live off their fat reserves. Their diet consists mostly of krill and small fish. Humpbacks have a diverse repertoire of feeding methods, including the bubble net technique. Like other large whales, the humpback was a target for the whaling industry. Once hunted to the brink of extinction, its population fell by an estimated 90% before a 1966 moratorium. While stocks have partially recovered, entanglement in fishing gear, collisions with ships, and noise pollution continue to impact the population of 80,000.
that are based upon the artists inspiration and creative expression. 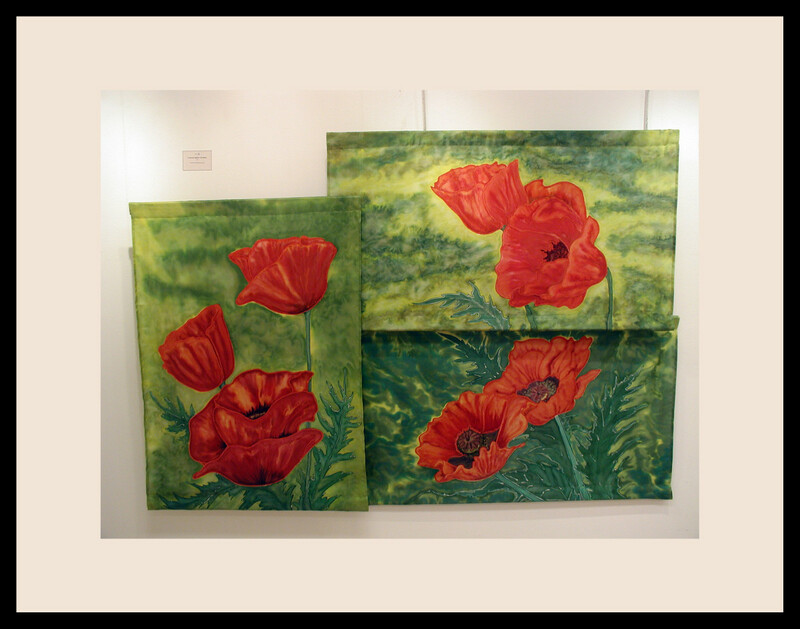 The images are NOT duplicated as in the SERIES Silk Wall Hangings. Canada's boreal forest comprises about two thirds of the circumpolar boreal forest that rings the Northern Hemisphere, mostly north of the 50th parallel. Other countries with boreal forest, also called taiga, include Russia, which contains the majority, the United States in its northernmost state of Alaska, and the Scandinavian and Nordic countries (e.g. Sweden, Finland, and Norway). The boreal region in Canada covers almost 60% of the country’s land area. The Canadian boreal region spans the landscape from the most easterly part of the province of Newfoundland and Labrador to the border between the far northern Yukon and Alaska. The area is dominated by coniferous forests, particularly spruce, interspersed with vast wetlands, mostly bogs and fens. The boreal region of Canada includes eight Eco-zones. While the biodiversity of regions varies, each Eco-zone has a characteristic native flora and fauna. The boreal forest zone consists of closed-crown conifer forests with a conspicuous deciduous element (Ritchie 1987). The proportions of the dominant conifers (white and black spruces, jack pine (Pinus banksiana Lamb. ), tamarack, and balsam fir) vary greatly in response to interactions among climate, topography, soil, fire, pests, and perhaps other factors. The Canadian boreal region represents a tract of land over 1,000 kilometres wide separating the tundra in the north and temperate rain forest and deciduous woodlands that predominate in the most southerly and westerly parts of Canada. Canada's boreal forest is also considered to be the largest intact forest on earth, with around 3 million square kilometres still undisturbed by roads, cities and industrial development. Its high level of intactness has made the forest a particular focus of environmentalists and conservation scientists who view the untouched regions of the forest as an opportunity for large-scale conservation that would otherwise be impractical in other parts of the world. The boreal region contains about 14% of Canada’s population. With its sheer vastness and forest cover, the boreal makes an important contribution to the rural and aboriginal economies of Canada, primarily through resource industries, recreation, hunting, fishing and eco-tourism. Hundreds of cities and towns within its territory derive at least 20% of their economic activity from the forest, mainly from industries like forest products, mining, oil and gas and tourism. 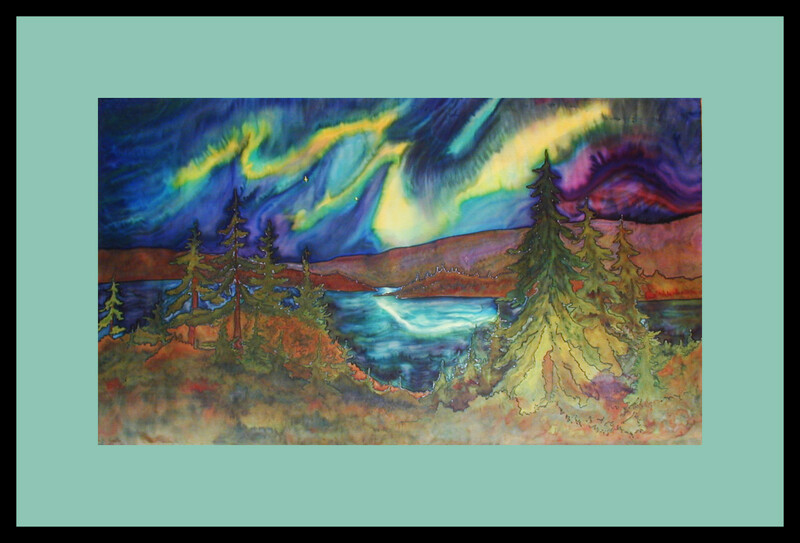 The boreal forest also plays an iconic role in Canada’s history, economic and social development and the arts. 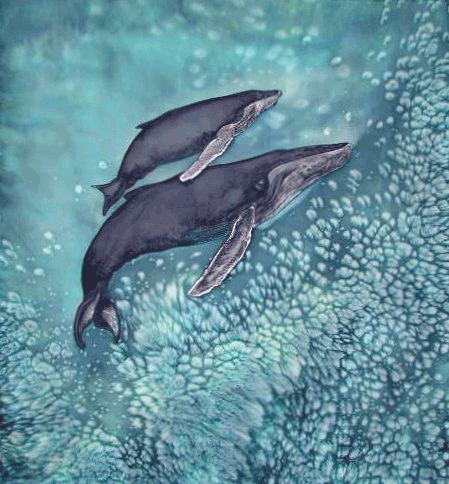 Dolphin in the Wild is a One of a Kind silkwallhanging. The piece captures the sunlight light filtering down through the water column and illustrates the special personality of the dolphin. Approximate size is 24" x 36". 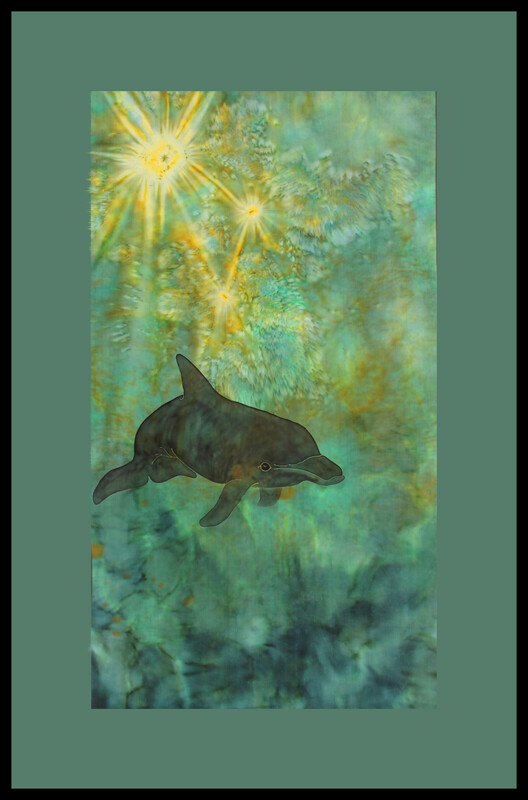 Dolphin in the Wild is a One of a Kind silkwallhanging. The piece captures the sunlight light filtering down through the water column and illustrates the special personality of the dolphin. Approximate size is 24" x 36". Grouping of Purple Iris. Each hanging is One of a Kind and unique hand painted on silk. 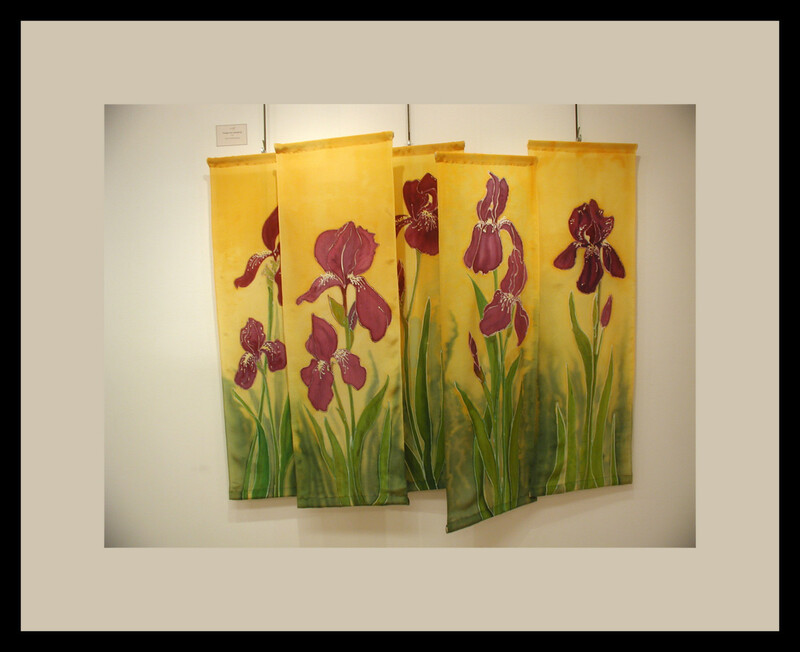 There are five panels in total, each panel measures 13"x42". 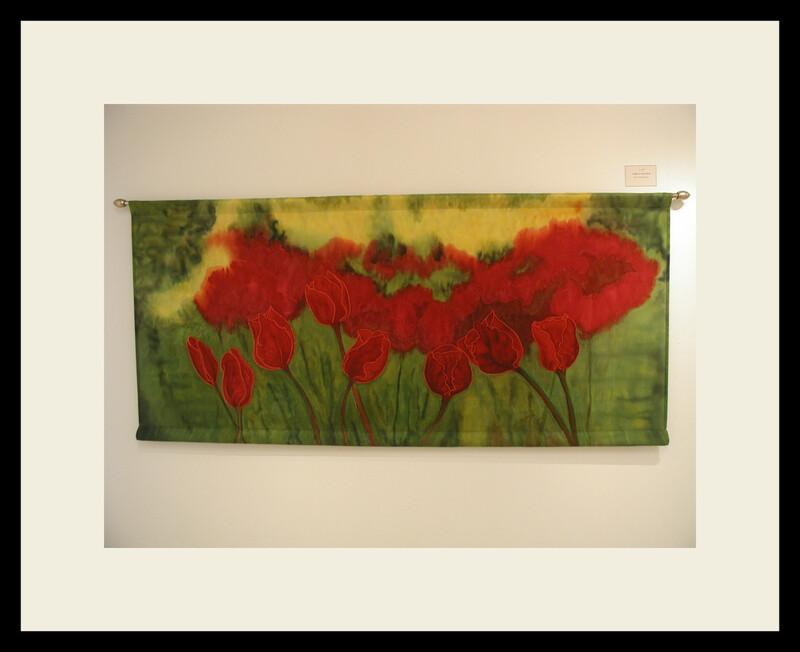 Tulips are a One of a Kind silkwallhanging measuring 67" x 30". The detail and colour of this painting demonstrates the high level of skill Jane has achieved. Grouping of Blue Iris on silk. One of a Kind unique design and colours. Approximate dimensions 26" x 15" per panel (3 panels total). 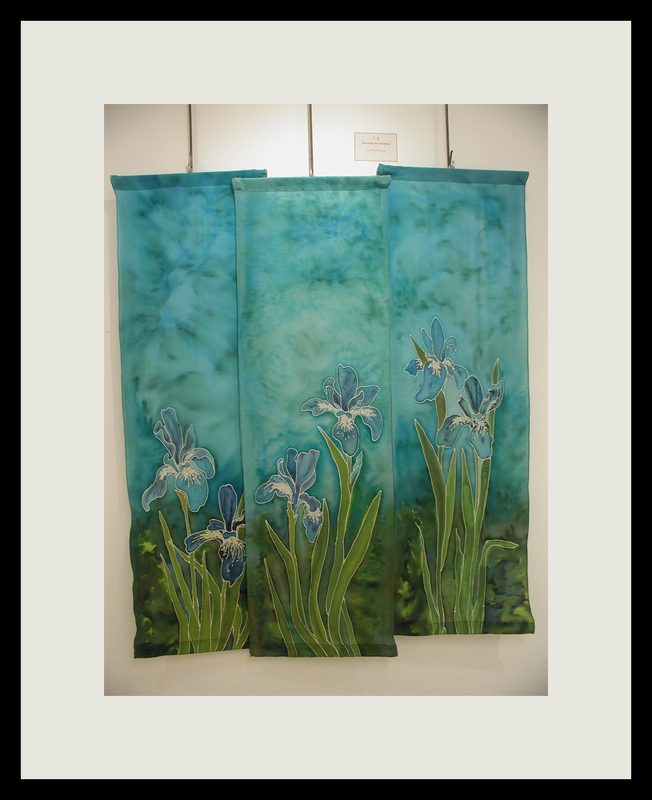 Grouping of Blue Iris on silk. One of a Kind unique design and colours. Papaver orientale (Oriental poppy) is a perennial flowering plant native to the Caucasus, northeastern Turkey, and northern Iran. Oriental poppies throw up a mound of finely cut, hairy foliage in spring. After flowering the foliage dies away entirely, a property that allows their survival in the summer drought of Central Asia. Late-developing plants can be placed nearby to fill the developing gap. Fresh leaves appear with autumn rains. 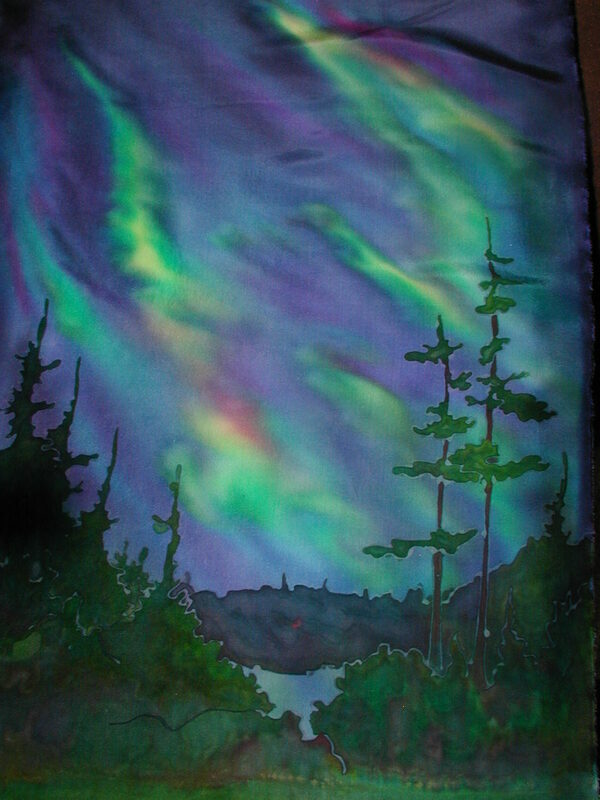 SWH-205 Northern Lights (Aurora) Size (17 inches x 21 inches) An aurora, sometimes referred to as a polar light, is a natural light display in the sky, predominantly seen in the high latitude (Arctic and Antarctic) regions. [a] Auroras are produced when the magnetosphere is sufficiently disturbed by the solar wind that the trajectories of charged particles in both solar wind and magnetospheric plasma, mainly in the form of electrons and protons, precipitate them into the upper atmosphere (thermosphere/exosphere), where their energy is lost. The resulting ionization and excitation of atmospheric constituents emits light of varying colour and complexity. The form of the aurora, occurring within bands around both polar regions, is also dependent on the amount of acceleration imparted to the precipitating particles. Precipitating protons generally produce optical emissions as incident hydrogen atoms after gaining electrons from the atmosphere. Proton auroras are usually observed at lower latitudes. 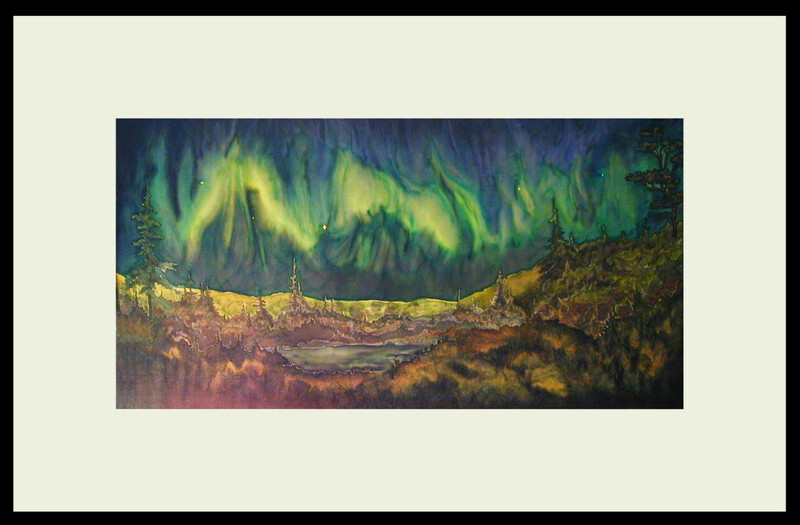 Different aspects of an aurora are elaborated in various sections below.